Having been around since 1947, Lego is one of the most popular toy companies in the world. It offers the most enduring toys that help children reach their full development potential emotionally, cognitively and socially. For a few years now, the Denmark-based company has been manufacturing toys that are marketed towards the imaginations of little girls. Lego now has a lineup of successful toys that prove girls’ love for those toys. But how do you choose a Lego toy for your little girl? 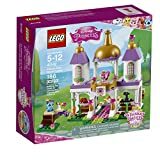 This post reviews the best Lego games for girls, with our top pick being the Lego Friends 41130 Amusement Park Roller Coaster Building Kit. Any Lego set for girls that are still on the market could qualify for this list. That gives a wide range of options and we considered a few. Anything that was more than just a castle or pet building blew us away. We narrowed it to the following 10 Lego sets for girls. It would be foolish of us not to consider the customer reviews and ratings when choosing the best girl legos. When necessary, we read the ratings on top consumer websites. It was also important that we consider the components and build. Like other Lego enthusiasts, we looked for something that was challenging yet fun to build. As for the components, it all came down to what was in the box. This is a crucial consideration when it comes to themed girls lego sets. Anything that offered a cool balance between cool features and girly was a winner. The most important thing when rating these sets was their appeal to young girls because ultimately, they are the ones who’ll be playing with them. 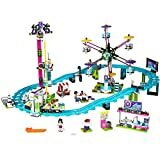 This is a push along roller coaster that comes with 1124 pieces including four carriages, all of which have a sitting mini-doll. It also features an entrance area with an opening safety barrier, functioning light brick, camera, control panel with levers as well as a long track with several obstacles. The dining area includes four stalls, a popcart with turning wheels, an Amusement Park information stand with a map and two tables. The Amusement Park is accessorized with a map, two tickets, two photographs and a coin bill. Lego offers a nice food variety that includes a hot dog with bun, soda bottle, water bottle, two watermelon slices, and two boxes of popcorn. Emma and Andrea are the original friends while Matthew and Naya are recurring characters. All of the mini-dolls are dressed for a day at the park in the summer. This kit has a rotating Ferris wheel with step ups to six gondolas. The entrance booth has a ticket office where your little girl can purchase photos from the rides as well as a rotating turnstile. We love the drop tower as it’s nicely accessorized with two cars that have opening bars, a camera, and spinning function. This is a 2-storey castle building that has a music room, patio, bedroom, revolving dance floor, dining room and bath area. There are a total of 186 pieces, making this castle detail oriented. You get two pets, one pink and one blue. You can prepare the castle for a grand ball by laying out the delicious cake or putting on a show in the music room. Better yet, have the guests party on the revolving dance floor. Both pets have their own special spots where they get a good night’s sleep. We love the fact that the towers of this castle are interchangeable with parts of the 41140 Daisy’s Beauty Salon, 41141 Pumpkin’s Royal Carriage and 41069 Treasure’s Day at the Pool. This allows you to create a customizable Palace Pets experience. Take care of your playful puppies with Mia and Andrea at Lego Friends Heartlake Puppy Daycare. It has a dog park outside with agility obstacles, a podium, and roundabout. The interior of the daycare features a feeding station, a bath, dog beds, grooming station, and even an office area. Like a real life dog day care, this one comes with everything you need to take care of a pup. Whether you need to clean the pups or make sure they nap, this daycare has it all. The Lego Friends Heartlake Puppy Daycare is well accessorized with a phone, computer, dog shampoo, grooming brush, feeding bowls, hair bows, bones, shovel bucket, stick, fire hydrant, trophy and a ball. You can use the phone and computer to speak to customers and take new bookings. When it’s playtime, help the pups jump obstacles on the course and play with them on the turning roundabout. This puppy daycare has a total of 286 pieces, which are easy to put together. It makes a great gift for 6-12-year-old girls who love cute puppies. The mini-doll versions of Andrea and Mia are a nice addition to the set. For the little girl who would love to explore Moana’s Island and recreate memorable scenes from the movie, this Lego set will make a perfect gift. She will get to learn more about the legends of Moana’s ancestors, play drums in the cave and even find the heart of Te Fiti. Better yet, she will be able to create her own adventures while living an island life with her pet pig, Pua. The kit features Pua, the pig, and Moana mini-doll. The cave covers an area measuring 3” by 4” by 1” and features a waterfall. Also featured is Moana’s house, which measures 5” by 9” by 3”. Moana’s island is accessorized with a coconut bowl, banana, two fish, the heart of Te Fiti, oar, pineapple and a shell. Whether you use the secret reveal function at the waterfall to find the heart of Te Fiti or use the rotating pole to cook fish, you are guaranteed hours of fun as you explore the island. Many users cited that assembling the set is quite easy and doesn’t take long. Build Disney Princess Moana's home, including a cave and waterfall with secret reveal function ! 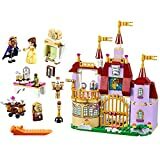 This is an excellent toy for the little girl who loves Beauty and the Beast as it allows her to recreate scenes from the movie and experience adventures. With 374 pieces, Belle’s enchanted castle model is incredibly detailed. It features a stained glass window, balcony, the magic mirror and enchanted rose. The rotating function in the ballroom floor and the dining table is a great feature that comes handy when organizing dances. The castle is well accessorized with a magic mirror, book, goblet, cakes, frying pan and a wig for the prince. We love the mini-doll figures of Belle and the transforming beast/prince. Also included are Cogsworth, Lumiere, Chip, Mrs. Potts, Babette, Stove and Wardrobe. The ballroom has a chandelier, a revolving dance floor, stained glass window, revolving portrait of the prince, library area, and dining room. Chip and Mrs. Pott get a kitchen with a trolley. Build Disney Princess Belle's Enchanted Castle with a revolving dance floor, second-story balcony, and a chandelier!